WHAT'S NEW IN SAWMILL 8.5? The most noticeable change from Sawmill 8.1 to Sawmill 8.5 is the improved performance and memory usage. Sawmill 8.5 has a completely new "under the hood" mechanism for accessing its files and databases, and as a result, it uses memory more efficiently. It adjusts its memory usage to the available system memory, so it won't exceed the available memory, and it won't use too little memory either, which could cause slower performance. New memory management settings in the Preferences allow you to tune Sawmill's memory usage, so it can use more if it's the only thing running on a dedicated system, or less if it has to play nice with a collection of other programs on the same system. The net result of these enhancements, and a slew of other performance optimizations, is a speed improvement of 50%-100% in most operations of Sawmill 8.5, compared to Sawmill 8.1. Sawmill 8.5 adds a new feature called "Snapons." Snapons are extremely flexible, and provide a method of modifying a profile and its database according to instructions defined in a standard module. For instance, you might attach a "downloads" snapon to your profile, and it would immediately add a "downloads" field to all your reports, showing the number of downloads of a particular file from your site. Or you could attach a "bounce rate" snapon, and you would get table columns and graphs showing the bounce rate for your web site. Snapons can be used to implement almost any Key Performance Indicator (KPI). 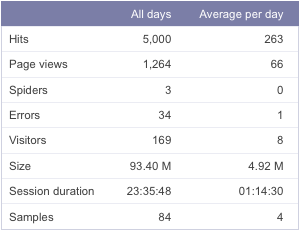 A number of snapons for common KPIs are included with Sawmill 8.5.0; more will be added in the future. It is also possible to create your own snapons; or our experts can create one for you, to implement your favorite KPI. The entire Sessions analysis in 8.5 is now implemented as a snapon; among other benefits, this allows session information to be removed from a profile in a single operation; that was an extremely time-consuming and error-prone operation in 8.1 (involving hundreds of manual profile edits). It is also possible to have multiple session analyses in a single profile, by attaching more than one instance of the Sessions snapon, for instance by user and by IP address, which was not possible in 8.1. And like most snapons and database filters, the database does not need to be rebuilt when attaching or detaching Sessions; database filters act directly on the database, and do not need the log data to be re-parsed, and database fields required by snapons are added or removed dynamically from the database as necessary. Sawmill 8.5 introduces a new type of filter, Database Filters, which operate directly on the main table of the database, after data has been parsed and imported from the logs. These are usually used in conjunction with Snapons: a snapon will often add a database field, and add a database filter to populate it, and a report field to report it. Sawmill 8.5 features a greatly improved Profile menu, which replaces the Config menu of earlier versions. This menu, which is available from both configuration pages and Reports, shows all available sections of the profile in a unified pull-down menu. Database Build and Update, Reports, Database Info, and all Config pages are available immediately from this menu. The Admin menu link has also been enhanced, to allow immediate access to all pages of Admin, from any page of the interface (including Reports, Admin pages, and Config pages), without having to go through the Profiles list. The Overview report in Sawmill 8.5 has been enhanced to allow unwanted fields to be hidden. In Sawmill 8.1, the Overview always showed all database fields; in Sawmill 8.5, it now shows report fields instead which also provides additional flexibility in formatting over database fields, and only those that are needed. 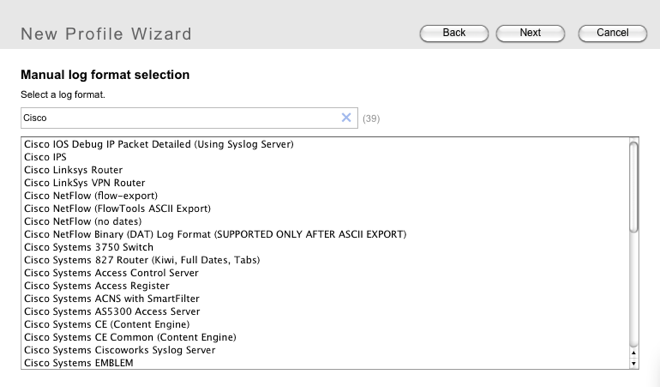 The New Profile Wizard has been enhanced in several ways, most significantly through the addition of a dynamic search field in the Log Format selection page. With support for more than 850 log formats, and more being added all the time, it could be difficult to find the particular format in Sawmill 8.1 if it didn't auto detect; in 8.5, you can type a part of the name, and as you type, it will show you a list of all matching plug-ins. We've been working to improve all aspects of the Sawmill user interface. Most of these changes are small, but they add up to a significant overall enhancement of the user experience. Sawmill 8.5 now includes a Password Reset functionality, which allows a user to reset their own password, if they've forgotten it, though a link emailed to that user's address. If your Sawmill installation has a lot of users, this automates one of your most frequent support tasks, saving you time.